This is a guest post from Dusty Saxton. 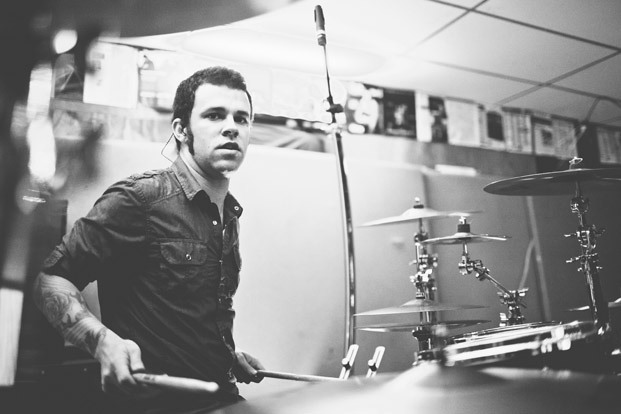 Check out all of the Pro Drummer Tips here. My name is Dusty Saxton, and I’m a touring and session drummer from Austin, Texas. I’m currently play with country artist Granger Smith. I toured with my original rock band, Ember, for four years between 2007 and 2011 and shared the stage with Hinder, Theory of a Deadman, Hell Yeah, Halestorm, Disturbed, Avenged Sevenfold, Black Stone Cherry, and Stonesour. Years ago, I was primarily a guitar player. In fact, I didn’t even own a drum set. Drums have always been my primary instrument, but however it happened, I spent many years of my life as a guitarist. During this time, I spent most of my money on effect pedals. I loved the idea of making my guitar sound nothing like a guitar. The soundscapes that were possible with delay pedals, loop pedals, and filters fascinated me. Over time drums came back into my life and I began to contemplate the concept of adding effects to my drums live. I tried this a number of ways but the best way I came up with was to use Ableton Live. Ableton has what are called “drum racks”. A Drum Rack is basically a drum setup, a collection of sounds, a chain of effects; whatever you may be using for a given song. Ableton itself sort of works as a sampler. I added electronic triggers to my drum set. One on my main snare, one on my kick drum, and one on my last floor tom. I also added a trigger to a 10″ side snare with a mesh head for purely electronic sounds. I bought an Alesis Trigger io interface to use the triggers with Ableton. I don’t use these triggers to replace the sound of the drum they’re on but to trigger an additional sound or a sound with an effect on it. Currently I play for a country artist named Granger Smith. Some of Granger’s songs have electronic drum loops in the intros, or an electronic snare or clap sound throughout the song. Bands I’ve been a part of in the past would have usually just tracked those parts and I wouldn’t have played them live, but I made it my goal to play every percussive part on the album (that my number of limbs would permit). Granger was already running his click tracks and automated light show in Ableton so it was easy to build drum racks for each song within his show files. Here’s where the programming work comes in. Granger has a song called Sleeping On The Interstate which on the record has an electronic snare mixed in with the real snare. I had Granger send me the electronic snare sound from the record, I created a drum rack for the song, loaded the snare sound onto the trigger on my main snare, and there you have it. Except, the song has a pretty long building intro which doesn’t need the electronic snare sound. Fortunately, Ableton allows you to automate pretty much any aspect of it. Ableton has what are called Macros. Macros are virtual rotary knobs that you can map almost any parameter of Ableton to in order to control or automate that parameter. In this case I mapped the Device ON/OFF button for the sound I was using on my main snare trigger to the first Macro of the drum rack. Since Granger uses Ableton for click track and for controlling lights, I created a track just for drum racks and added a MIDI clip to run for the entire length of that song. Creating this MIDI clip allowed me to automate the Macro assigned to the Device ON/OFF for my main snare trigger throughout the course of the song turning itself on or off only when I needed it. In the case of this specific song, I didn’t need it for the first 45 seconds of the song. Ableton organizes its tracks as scenes. In my case, for each song there was a track for click, a track for lights, and now a MIDI track for my drum rack automation. Each ‘scene’ includes the click, lights, and MIDI drum rack automation, for each song. When you play a scene it starts all 3 tracks simultaneously and they run together. This meant that I could hit play on the scene for Sleeping On The Interstate and count along with the click until I wanted the trigger sound to turn on, then right at the moment when I needed it, I changed the automation to ON. The sound remained off for the duration of the intro and then turned itself on for the rest of the song when I needed it. I did this for another song that had a kick drum break. I had added a trigger to my kick drum that I wanted to put a cowbell sound on for that break so I would be playing an electronic cowbell and my kick drum at the same time. I did this the same way. I made a drum rack for the song, created a MIDI clip for the MIDI drum rack automation track, found a cowbell sound that I liked, placed that sound on my kick trigger, hit play on the scene for that song, counted along with the click track until I found the in and out points of the kick drum break, and mapped the automation to turn the sound on only when I wanted it on and turn itself off when I no longer needed it. The problem now was how to switch between drum racks. I could just turn both sounds off and leave them off for the rest of the show, but I wanted to put different sounds on my snare for different songs, or have my kick drum trigger an 808 bass hit or a vibraslap. I didn’t just want to use a cowbell on my kick drum for the rest of the show. Luckily, drum racks have what is called a chain selector. This is used to switch between different chains of effects, but we can use it to switch between drum racks. I continued to think up different ideas for different songs. Some songs didn’t need any electronic sounds, and others did. I ended up making 9 drum racks for different songs in the show. I mapped the chain selector to a Macro and changed the MIDI automation so that each song would load its own drum rack as soon as I hit play for that song’s scene. If a song didn’t have a drum rack the chain selector would go to 0, which didn’t activate a drum rack at all. On one song I put a trigger on my side snare, loaded a snare sound onto the trigger, and added a filter delay sound to the trigger but I made the delay effect 100% wet. This way I only heard the delay sound and not the actual trigger sound. Having a delay effect on my side snare and playing along with it in tempo with the song made for some really cool grooves. The awesome thing about Ableton is being able to automatically turn sounds on and off. I even applied an 808 bass hit to my kick drum, turning it on and off really quick so that I could play the beat of the song and that one specific downbeat would trigger the 808 and all I had to do was play the beat normally and the computer would turn the sound on only for the one hit that I wanted the 808 applied to. I had essentially created an effects loop and pedal board for my drum set, and could automate when the effects loop would turn itself on or off even down to just a single beat. I connected my iPad wirelessly using an app called Touchable, which is a remote control app for Ableton, and using an XY pad on the iPad I would manipulate delay effects on my snare. One song had a quick build that ended into a break with no drums. I programmed the automation for a clap sound on my main snare trigger to turn itself on right on the very last hit of the build and echo out into the break with no drums. I programmed the XY pad on the iPad to turn the delay feedback to 100% as soon as I touched it. I mapped the X value of the iPad to the delay time. Moving my finger to the left would slow the effect down. The Y value I mapped to a couple of different things. I mapped it to a filter that would take all the high end out of the sound as I moved my finger down, and I also mapped it to a reverb that would increase as I moved my finger up. I also set the minimum delay feedback value at about 50. We finish out the chorus, do a 2 measure build, then silence, but on the last snare hit of the build, the drum rack automation turns on the clap sound applied to my main snare trigger loaded with all these effects. The sound starts to echo, I touch the XY pad on the iPad which turns the delay feedback up to 100%, I slide my finger to the bottom left corner which slows the delay time down, drops the pitch (because its an analog delay effect), takes all the high end out, and as I move my finger towards the top right corner, the delay time starts to speed up, a reverb adds in, the high end of the filter comes back, and once my finger gets to the top right corner I let go, the delay feedback goes back to 50%, and the sound gradually fades out like a space ship shooting off into the distance. Pretty crazy sounds to be coming from a drum set, and just some of the possibilities that are capable from integrating Ableton and electronics into your acoustic kit. The simple application is that it allows me to include electronic percussion sounds directly out of the records from the artists I play with, and load different sounds up for different songs quickly and easily, the computer does all the work. And on the extreme end, it allows me to add delays, filters, and other effects to my drums and manipulate them live with an iPad. I’m learning new things about it every day and I’m excited to dive deeper into the world of Ableton and add more effects and things to make my drum set and live performance more musical.